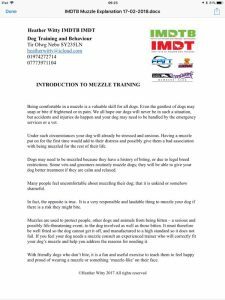 Heather Witty will be at our training session on Tuesday 20th February 2018 to give some guidance on training your dog to wear a muzzle. 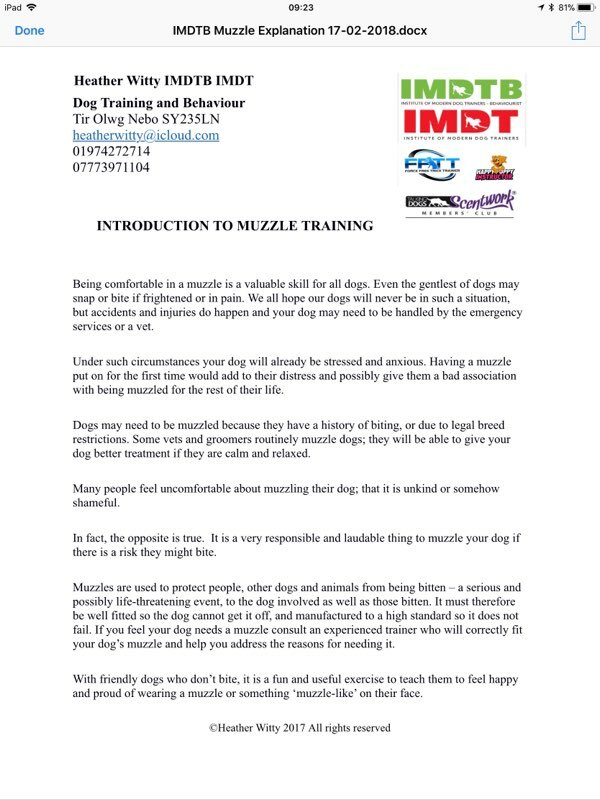 “Being comfortable in a muzzle is a valuable skill for all dogs. Even the gentlest of dogs may snap or bite if frightened or in pain. We all hope our dogs will never be in such a situation, but accidents and injuries do happen and your dog may need to be handled by the emergency services or a vet”. Heather will be available on Tuesday 20th (and 27th February if required) to provide some training and advice in the relaxed and fun atmosphere at the club…far-removed from the often stressful muzzle-wearing-experience of the vets waiting room!